Family members at the dedication are, from left, grandson Stefan Lallinger, granddaughter India Nixon, daughter J.B. Redding, granddaughter Monika Lallinger, daughter Ann Holmes Redding, grandson Lucas Lallinger and daughter Rupa Redding-Lallinger. ON THE GREEN | By winning a 1950 decision in Delaware Chancery Court, Wilmington attorney Louis Lorenzo Redding opened up the University of Delaware to African American students. 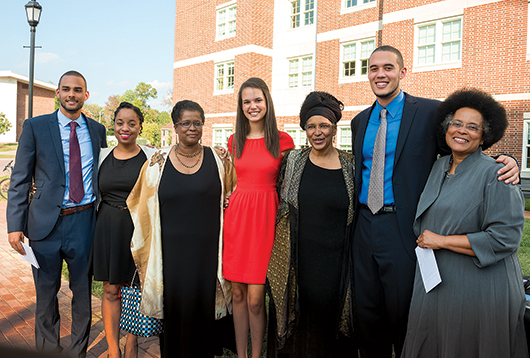 On a fall Friday in 2013, members of the Redding family and friends joined with members of the University community to honor the pioneering civil rights lawyer by officially dedicating the Louis L. Redding Residence Hall on East Campus. UD President Patrick Harker welcomed the guests at the ceremony, which also marked the opening of the adjacent Eliphalet Gilbert Hall, named for the University’s first president. Harker noted that by honoring Redding and others who pursue justice, the University rededicates itself to its core principles of diversity, equity and inclusion. Attending the dedication were Redding’s daughters, the Rev. Ann Holmes Redding, president and founder of Abrahamic Reunion West, a nonprofit dedicated to peacemaking; Rupa Redding-Lallinger, professor of pediatrics and internal medicine at the University of North Carolina-Chapel Hill; and the Rev. J.B. Redding, founder and CEO of Caring Hands, who gave the invocation. 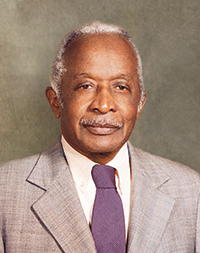 Leland Ware, the Louis L. Redding Chair for the Study of Law and Public Policy at UD, noted that efforts to endow a chair in Redding’s name began shortly after his death in 1998. Also speaking at the dedication ceremony was James Jones, director of UD’s Center for the Study of Diversity and professor of psychology, who lauded Redding as an American hero and a Delaware treasure. Redding’s commitment to justice saw him through his undergraduate years at Brown University, where he graduated with honors in 1923, and through Harvard Law School, where he was the only African American in his 1928 graduating class, Jones said. He cited Redding’s endurance as the only African American lawyer in Delaware for 26 years. Redding’s legacy, Jones said, is reflected in the growth from single-digit numbers of African Americans on campus in the early 1950s to the 2,459 students of color attending UD this fall.